Wearable technology has created quite a buzz as hot products by big brands, like the Apple Watch, hit the market. But it’s not all watches and Twitter dresses. A multitude of functional yet fashion-based products are in development. 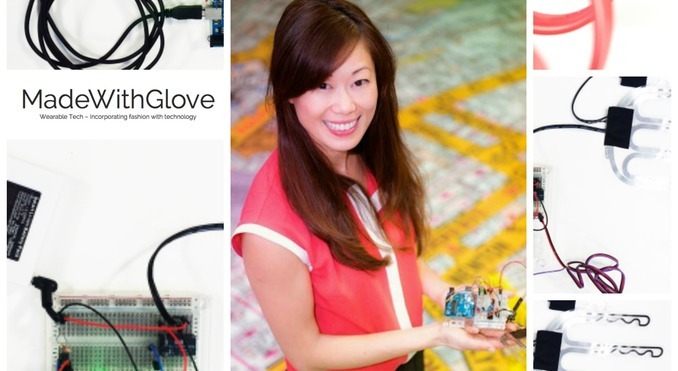 We caught up with entrepreneur and founder of Made With Glove, Michelle Hua, to find out about her journey with wearable technology so far. What did you do before you started Made With Glove? I was a senior commercial property solicitor for eight years in Australia, before taking the plunge into entrepreneurship in the UK. I also worked in two of Australia’s largest departments stores, and have eight years experience in women’s retail fashion and two years in men’s retail fashion. I worked for brands such as Levi’s and Polo Ralph Lauren as well as other leading Australian brands. My focus now is to incorporate fashion with technology because I believe this is the future. As we move to rely more on technology, I want to create a product that not only looks good but is also combined with functionality. What is the product that you’ve designed? I am designing fashionable heated gloves for women. My idea came about four years ago during a six-hour walking tour in Prague, I was in snow and a temperature of -21 degrees. Two hours into the tour, I couldn’t feel my hands or my feet. I had disposable hand warmers but because I had my gloves on, I couldn’t feel the warmth from the hand warmers. So, in a moment of sheer desperation, I put my hand warmers inside my glove and felt immediate relief. Upon returning to the UK, I researched fashionable heated gloves for women. All I could find were big, black and bulky heated gloves for men who ride motorcycles, or for skiers out in the snow. What is the product development process for your gloves like? The product development process is quite challenging because you have to always think two steps ahead. Building a one-off prototype is already a challenge, but the real challenge is designing and building it for manufacturing, and developing a supply chain so that you can take it to market. Speaking to my potential customers – women who suffer from cold hands – who need my product. Hearing from them inspires, motivates and encourages me to keep going. When my potential customers describe the pain they feel when their hands get cold, and their inability to find products that suit their needs, it gives me hope that my product will provide them with the solution. What setbacks or challenges have you encountered? The main challenge for Made With Glove, as it is for most start-ups, is funding. I have applied for numerous funding opportunities and competitions from the UK Government, and while I have gone so far as to become a finalist, I have narrowly missed out on some of the funding. I am very fortunate to have made it to the Final and to have had the opportunity to pitch to and answer questions from judges. It has given me the experience and practice I need for pitches in the future. I won a wearable technology hackathon in 2014, and I have also received funding and support from Lancaster University that helped me build my prototype. Partnering with one of the top universities in the UK has been tremendous, I have been invited to attend various events, and have been supported not only in the prototype building but in other aspects of my business – they have provided support in funding applications, as well as giving me the opportunity to exhibit my prototype at the Royal Institution London. I also came runner-up in the Marketest online market research competition in London and won £500 worth of market research. Winning these competitions has really helped my business to move forward, and given me further motivation and determination in building my product. I am in product development now and I plan to launch a prototype by winter this year (2015). We are in very exciting times because we are seeing more wearable technology become fashionable and targeted towards the female market. Fashion and technology are such diverse industries, and I am constantly innovating and being creative which I love to do. My hope is to always be creative and innovative and to work with partners and people who are as passionate as I am in incorporating fashion with technology. What are the key things that one needs to do in order to build a successful Wearable Technology product? The key is having the market to build the product for. Then you need a good team. In my opinion, the key to building a successful business, in general, is having a team with the right expertise running all aspects of the business. It’s all about providing a solution for your customers and to do that, you need to build the right team to build the product and help you run the business. Follow Michelle on Twitter: @madewithglove and visit the Made With Glove website for more information on her product. To discuss all things wearable tech, you can contact Michelle via email too: michelle.hua@madewithglove.co.uk. Previous articleWhat happens during an intellectual property battle?